If you are affiliated with or working for Adidas, Manolo Blahnik, Converse, Louis Vuitton, Chanel, Burberry, Hermes, Prada, Air Jordan, Nike, Timberland, Gucci, Cartier, Mitchell and Ness, or Jacob and Co. either directly or indirectly, or any other related group, or were formally a worker, you CANNOT enter these web pages, links, nor access any of its files and you cannot view any of the HTML/PHP files. If in fact you are affiliated or were affiliated with the above said companies, by entering this site you are not agreeing to these terms and you are violating code 431.322.12 of the Internet Privacy Act signed by Bill Clinton in 1995 and that means that you CANNOT threaten our ISP(s) or any person(s) or company storing these files, and cannot prosecute any person(s) affiliated with this website. By continuing to enter this site, you are expressly and implied agreeing to all terms as stated above, and affirm that you are in compliance with all federal, state and local laws concerning the content of this site. Also, LIQUID KICKS is in no way affiliated with, representing, associated or sponsored by Adidas, Air Jordan, Burberry, Chanel, Converse, Gucci, Hermes, Louis Vuitton, Manolo Blahnik, Nike, Prada, Timberland, or any other above mentioned name brands of their products. We do not represent our replica products to be original nor do we represent that they are exact copies, therefore, they do not violate any copyright laws. We simply ask consumers to compare quality and price of the above mentioned name brands to ours. Any reference to brand names or "compare to" are made strictly for comparison and to encourage consumers to immediately go buy the real product after comparing. 1. We check mail and submit orders on a daily basis. Once we get your order, it begins the processing period. This may be just a few days or it could be a couple weeks. So you SHOULD receive your products in about a week, however, some factors may play a big role so PLEASE ALLOW 5-12 business days to receive the merchandise. 2. High school jerseys are always shipped by USPS. Shoes are shipped usually by either USPS, UPS or TNT. 3. We can now ship WORLDWIDE!! 5. We can ship to APO addresses, PO boxes, etc.! 1. We will exchange and refund in certain circumstances. We hold the right to make the judgment. If we ship the wrong shoes, then you ship them back to us and we will correct. If your shoes are out of stock then we will ask for you to rechoose or we will refund. 1. 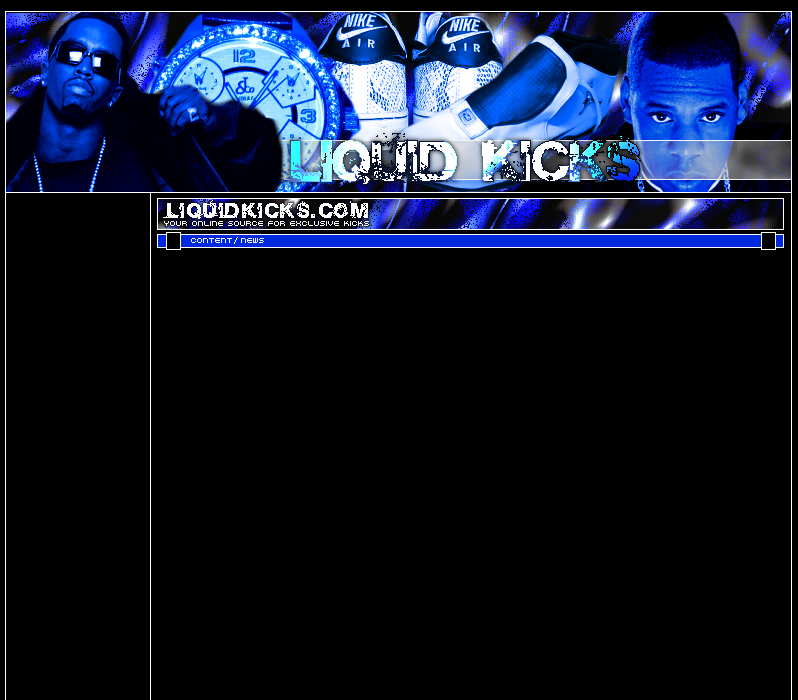 Liquid Kicks has no affiliation with Nike, Gucci, Jordan, Burberry, or Timberland. 3. Shipping/handling is included in the prices! 5. NBA logos on the shoes are HEAT PRESSED. 6. High school jerseys are made of 100% nylon. The letters and numbers are screen-printed on the jersey. 7. The Mitchell and Ness jerseys are made of 100% polyester. 1. Can you get any other sizes like women's, kids, or large men's? - Sorry but all we have is what are showed. Some items have other sizes available, but what is available, is listed. 2. What kind of deal can you give me? Can you hook me up? 3. Are your shoes fakes or knock-offs? - Yes, our shoes are factory variants. We do not advertise them as being authentic. We just advertise them as high quality replicas. They are made in China, just like the authentics. The thing is, with variants, you also have UNRELEASED COLORS AND STYLES! They are not the originals, but they can be their own originals in the sense that there is no other pair that has came out like yours! 4. Once I order, how long will it take for my shoes to arrive? 5. How much is shipping & handling? - All prices include all shipping and handling fees!